Looking for a great side dish for your barbecue party? 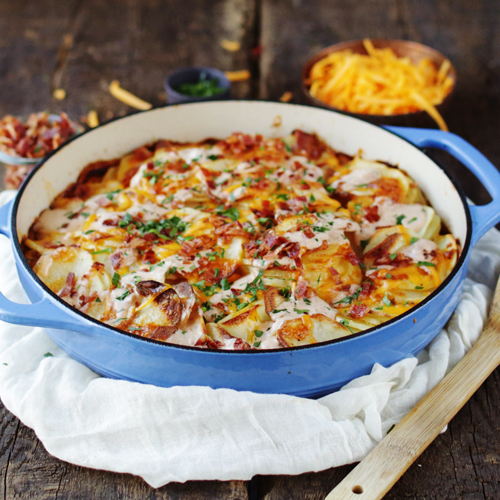 Try these tasty Scalloped Potatoes with Spicy Ranch, Crispy Bacon and Cheese! Recipe developed by Billy Parisi. Place the potatoes in a 12" cast iron skillet or 9"x13" casserole dish and coat them in the olive oil, salt and pepper; fold in the shredded cheese. Bake the potatoes for 60 minutes or until browned on top and tender. While the potatoes are baking, mix together the ranch dressing and salsa in a small bowl until combined. Once the potatoes are done cooking, evenly drizzle on the salsa-ranch dressing, chopped bacon, and parsley. Serve hot.